The Knox Mountain records show that John Haftner, of New Westminster, first started racing at Knox Mountain in 1972. He's won it a few times since his start in a dune buggy. And, to this point, holds the quickest time up the mountain -- 1:37.065 for the 3.5 km (2.2 miles) climb. He also raced solo gymkhanas at various locations in the lower mainland. One year, 1974, he had fast time of the day for a national solo event. Clubs ran events across Canada on the same layout and the times were recorded as if they were all in one location. Like I say John was number one. Not sure if he repeated that or not. Here is one of his more recent runs up Knox Mountain. Les Vogt, if he ain't the original Vancouver rocker, then who is? Lots on Les right here. Racing scene from the 1957 movie The Devil's Hairpin. Directed by and starring Cornel Wilde. Playing at the following theatres back then. A couple 1954 clippings showing that the talent Eugene Thiessen brought north to Chilliwack wasn't a fluke. He was good. An exchange from an early episode of the TV series Combat! Keenan Wynn is some bigshot, loudmouth brass and Shecky is a buck private who is supposed to be the jeep driver but the Colonel jumps in the seat. Keenan Wynn: "Used to race a little before the war. Mostly midgets. You ever drive a midget?" Shecky Greene: "They wouldn't drive with me, sir. Sorry, sir." All that to bring out this little item that has one time sprint car champ Jimmie Wilburn lauding the skills of driving a jeep during the war. 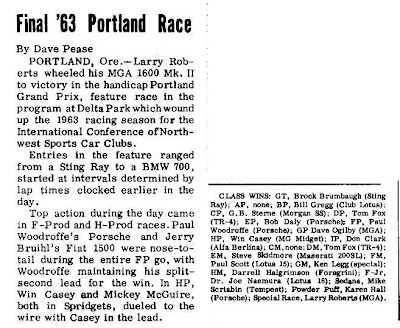 Some footage from an October, 1963 race at PIR. Looks like the Pooper at 1:20 and Bob McLean in the Lotus at 2:20. Could be wrong there. I don't know much about Al "King" Taylor. There is an Alvin Taylor in the GVMPS but I'm not sure if this is the same guy. About the right era. Anyway this Al Taylor had hopes and dreams. Billy Foster, 1965. Used to be the common answer. But, no, Billy wasn't first. And Eddie Kostenuk, also of Victoria, didn't qualify in either 1962 or 1963, even though his car was qualified in 1963 by Johnny Rutherford. Pete Henderson, 1916, has been the answer for a while now with Billy Bourque, 1909, thrown into the mix just to create controversy. Pete's first Indy 500 was actually only 300 miles. His second, in 1920, was 500. He finished 6th in 1916 and 10th in 1920. Bourque ran at Indianapolis before the 500 mile Memorial Day Classic. And, sadly, he was killed during one of those 1909 races. 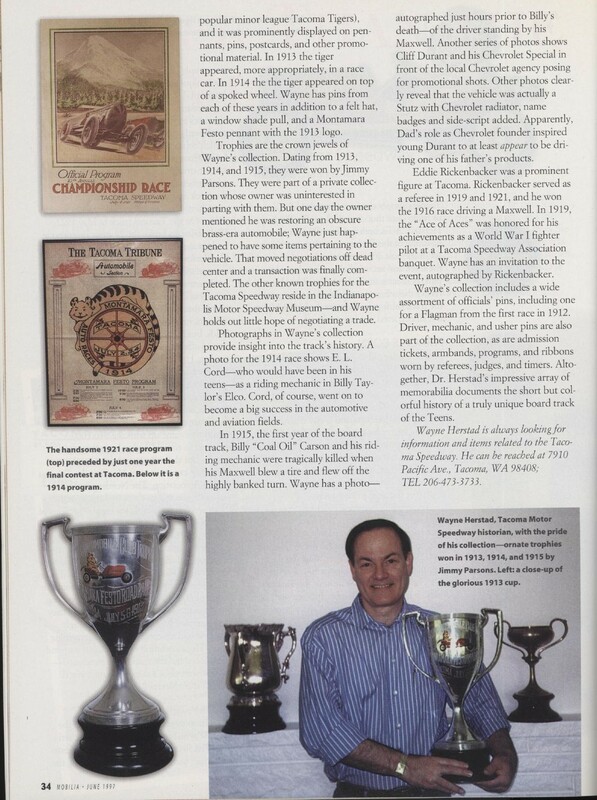 If you're in this biz, hardly a day goes by without something from the Indy Racing League or the Indianapolis Motor Speedway landing in your mailbox. The Indy communications people who churn this stuff out are so good that if a race driver blows his or her nose somewhere, I swear a press release will quickly follow. Now, much of what has been delivered so far this year has to do with the Indianapolis Speedway's Centennial celebrations. 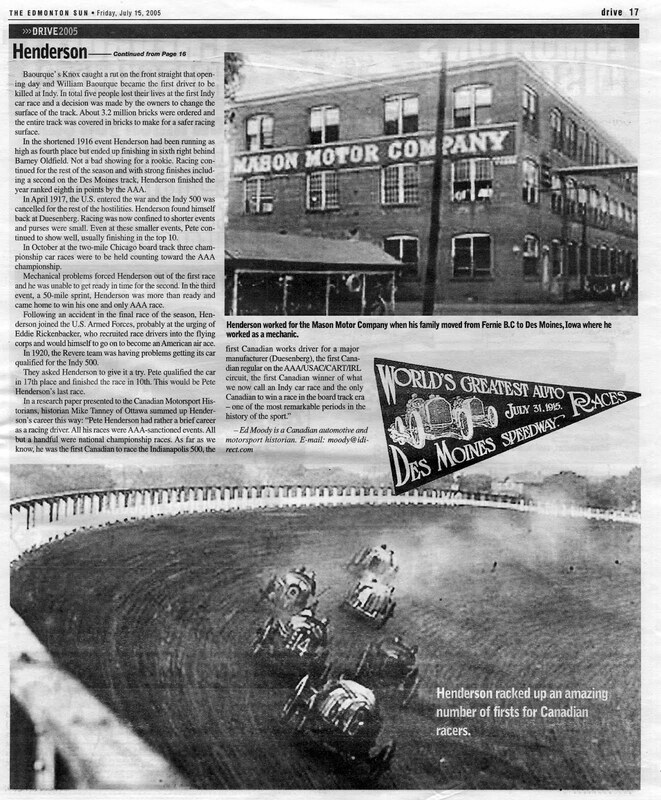 It was 100 years ago that the track opened – although the 500-mile race for which it's best known wasn't started until two years later, in 1911. As of today, we're about seven weeks short of the actual anniversary of the speedway's opening, which was June 5, 1909, when a gas-filled balloon race was held. And the anniversary of the very first scheduled motor race – seven motorcycle races, in fact – won't arrive until Aug. 14. But there's a little-known Canadian connection that I'd like to share with you. 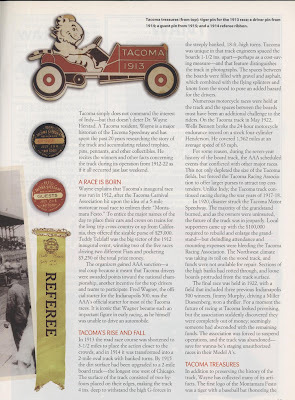 Although the anniversary of the motorcycle races is said to be Aug. 14, 1911, the meet was rained out, according to an auto racing magazine of the day, Speed Age. When they finally got going the next day, the show was called off after just three races following a series of violent flips. 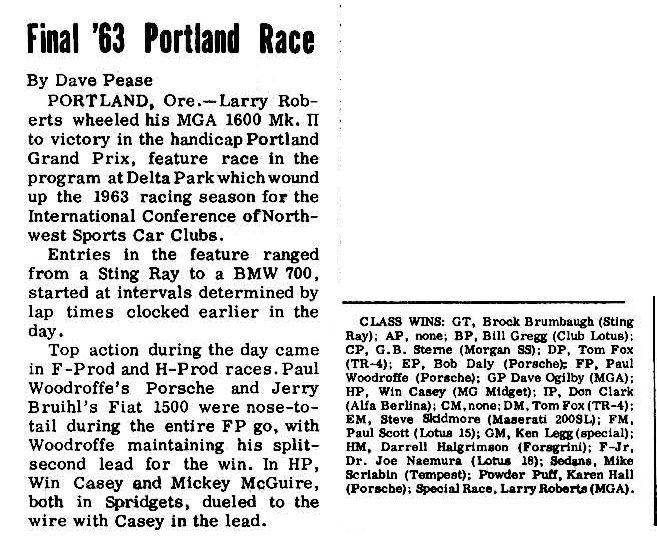 This rainout and subsequent cancellation of the rest of the next day's races then set the stage for the first auto racing at the Speedway, which took place on Aug. 19. 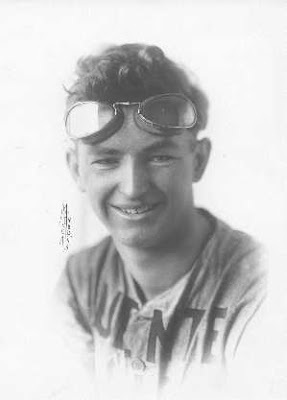 Although it is not a claim to fame that would be high on anybody's list, Bourque's death is still historically significant and ranks right up there with Baker winning the first motorcycle race, Barney Oldfield of Wauseon, Ohio, setting the first speed record at the track (43.1 seconds to go a mile) and Louis (Louie) Schwitzer of Silesia, Austria, winning the first auto race. Bourque was in his teens when he moved from Quebec to Springfield, Mass., to work for the Knox Automobile Co.He started as an apprentice and showed his talent behind the wheel by qualifying to be a test driver. According to historians, Bourque was an excellent driver who was known to have "outstanding nerve, judgment and physical strength." 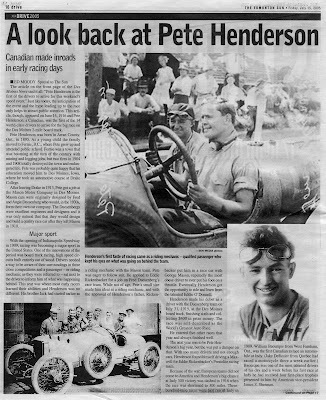 The week before his death, he'd won four prizes at a race meet in Richfield Springs, N.Y.
Bourque, who was engaged to be married there later that year, had won one race that fateful day and was looking to win again when he went out for the feature event, the 250-mile Prest-O-Lite Trophy Race. 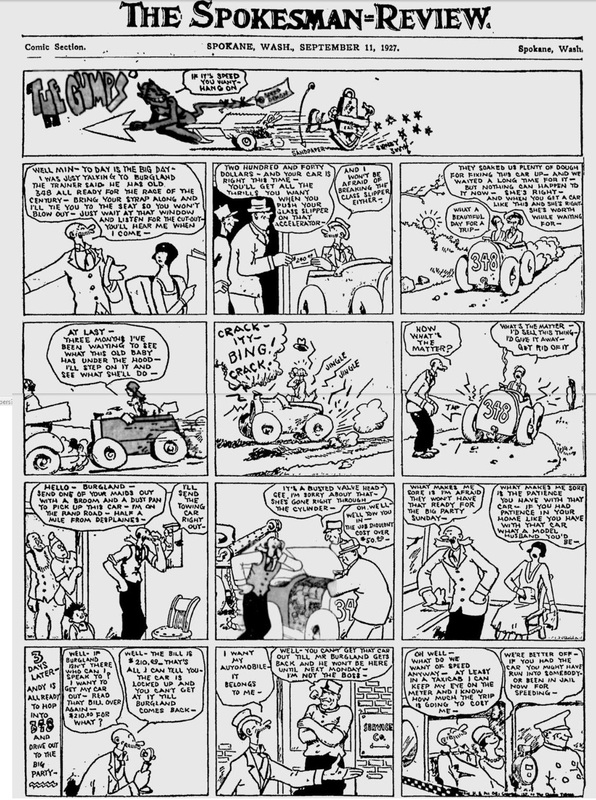 He was battling Bob Burman for the lead and was holding off Louis Chevrolet when disaster struck. "It was a gory beginning, and the newspapers played the theme no end. Eyewitness after eyewitness was quoted, almost crowding out the story of the races." In fact, two days later, on Aug. 21, the Indianapolis News reported: "There were more women in the crowd than on Thursday and they appeared to be the most interested of the spectators. The killing of the two men, it seemed, only served to increase the excitement." Three more people died that weekend – a riding mechanic and two spectators when an out-of-control car flew into the crowd. The coroner was not amused, announced he was holding the Speedway responsible – in particular for the deaths of Bourque and Holcomb – and recommended an investigation by a grand jury. The end result was the paving of the crushed-stone-and-tar speedway with more than three million red bricks, hence the nickname, "the Brickyard." And William Bourque? Consigned to history, until now. 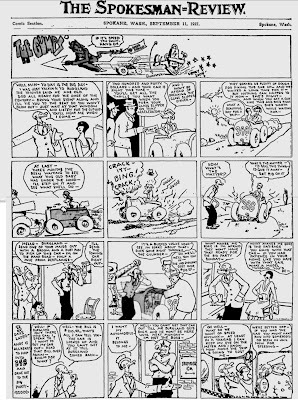 Stumbled across another "348" Sunday page featuring The Gumps. Okay, a blast from the past. The Seeds of Time doing Crying the Blues. Because he won so much he got the nickname "Ho Hum", like winning wasn't a big deal. And he travelled and won. A lot. This win was a Reading, Pennsylvania. Lewiston, ID, 1962. Vancouver driver, Bill Hall is part of the photo action. 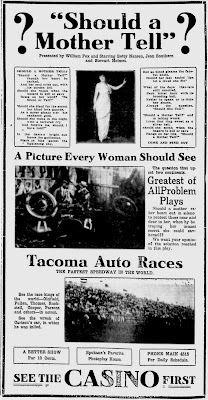 Came across this ad for film footage of the 1915 AAA at Tacoma. I wonder if it still exists? Until then a 1913 Keystone film titled "The Speed Kings", and featuring Earl Cooper and Teddy Tetzlaff will have to do. Also features Fatty Arbuckle. 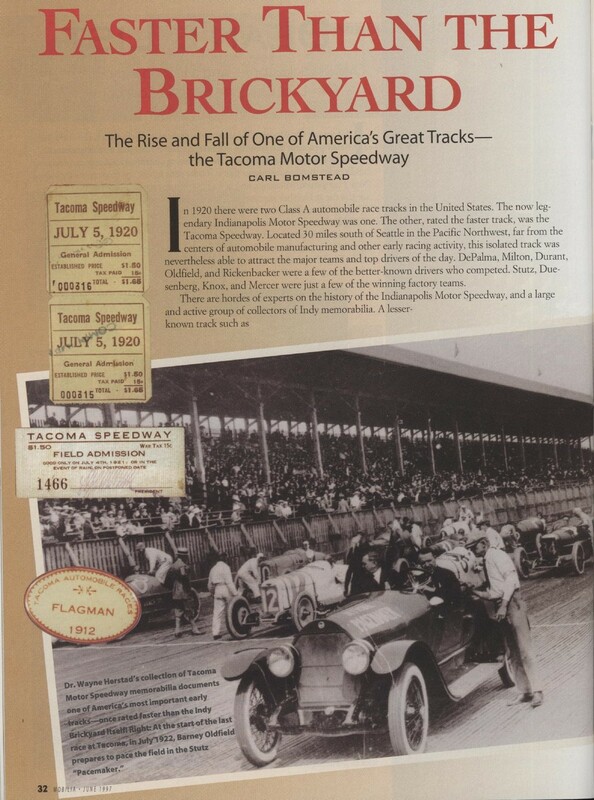 The big historian of Tacoma Speedway, Dr. Wayne Herstad, gave a talk on the speedway a couple years back. It's broken up into five parts. I'll embed part two, as the first part has a bunch of "society" business being taken care of before the talk begins. Sound is poor, as in "turn up the volume! ", but with headphones on I heard most of it. And the last section has the camera pan over some of the memorabilia. More Tacoma Speedway info here. An old, if 1997 is old, article about Tacoma Speedway. Big American Automobile Association (AAA) races were held there from 1912 to 1922. From 1915 until the end it was a two mile board (as in lumber) track. Three pretty interesting videos from Skagit Speedway, circa 1973. I see Al Mullet's No. 29 super stock amongst others that came north to race at Langley Speedway. Vancouver rockabilly band circa 1957. More info on The Stripes here and here.